Got a rock chip in the windshield of my 2016 Z06. Went to two auto glass shops and they were both close in quotes for replacing. Both said the existing windshield could not be repaired. For OEM glass, installed, they want a little over $1000 and change. Does that sound about right? Both shops recommended that I go with OEM glass to keep the car original. Their prices are about $200 less for after-market glass. Thanks for your comments. OEM glass is not going to make your car any more valuable... use Safelite. I've had windshields replaced in a C4, C6, CTS-V, and my C7, all by Safelite -. my C7 has heads-up display. Good glass. 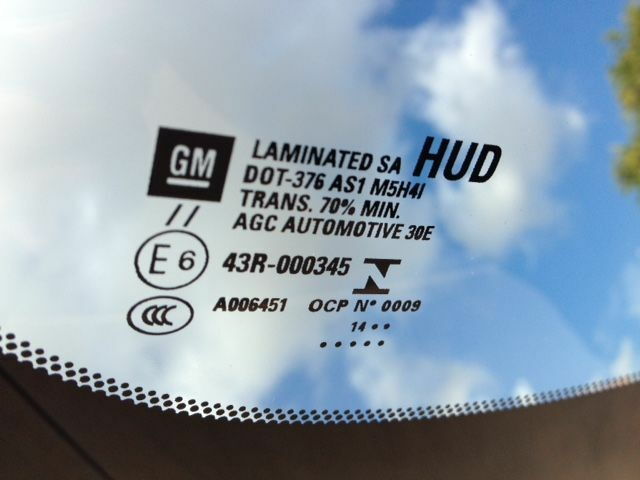 If you have a HUD you might want to use OEM glass or at least make sure the aftermarket glass is HUD compliant. I’m using Safelite for my 17Z. They recommend OEM due to HUD. It’s about $1100 if I remember correctly. Haven’t got it done yet. Mine needs replaced as well. What are the differences in non OEM glass that would effect the HUD though? I believe it’s the glass area where HUD projects. Not sure if it’s the entire glass itself. I had some debris hit me driving down the freeway. I had the whole front of my C7 repaired including the windshield. The dealer collision center charged about $1000 for just the windshield. I had my old Lexus SUV windshield replaced a couple weeks ago by a small shop for $185. All HUD glass has a reflective layer of plastic between two sheets of glass. There is a lot of variability in the clarity of this plastic sheet between the manufacturers. There is also variability in the clarity of the glass from different manufacturers. Most often you can see the result of poor quality plastic and/or glass when the sun reflects on your windshield and you see all those little gel spots or imperfections that reflect the light. I can't speak to which windshield has the best clarity, although I'd have a conversation with the installer and tell them your preference on whether cost or quality is the most important to you. Let them help you with the decision. Last edited by thompstl1; 03-19-2019 at 09:18 AM. just curious..does your insurance company cover glass breakage, windshield replace? I recently had a chip/ star type crack repaired for free by safelite through progressive ins..the adjuster advised if it gets worst they would replace using my $ 250 deductible. Safelite replaced my windshield for the 2017 HUD with OEM and the cost was around $1100. Recommend replacing the windshield with OEM. I have no experience with aftermarket windshields for the vette, but I could easily see this being a mistake because of quality and making sure the reflective area is where it needs to be....and effective. If no hud, get a cheap replacement. See post #2..... I have 84,000 miles on my C7 w/HUD - zero problems with the Safelite window... not my first Safelite windshield. Not Corvette but I had an insurance windshield replacement on my Expedition years ago for about $1000. A year or two later I had the windshield replaced out of pocket for about $200. There’s a reason glass shops pay your deductible on windshield replacement. So $ is apples and oranges depending on who’s paying. Can't imagine leaving home without glass damage insurance. So we don't. And thus the point is moot for us. But I'd be wary of anything that was 'just as good as' OEM. Likely it isn't. Or isn't always. So when is it and when is it not? Make sure the installer has done a C7 before. You have to take apart a lot of trim to do the glass. First, the Comprehensive part of your insurance policy covers glass breakage and you aren't penalized if you collect on it. Hopefully, you have a low deductible on the comp so it covers most of the cost of the windshield. As far as getting OEM Glass that can be a crap shoot. GM Service Parts orders their glass themselves and do not necessarily choose the same supplier as the assembly plant does. Thus you may order the glass from a dealer but still get what would be called a non OEM glass because it won't have any of the markings that are on the glass delivered to the assembly plant. Last edited by KenHorse; 03-19-2019 at 05:48 PM. I concur with Ken. Most insurance coverage includes glass replacement, no deductible. Always insist on OEM! Safelite is fine, but not their glass. Absolutely get OEM. Do an internet search on OEM vs Aftermarket windshield. Last edited by KCV; 03-19-2019 at 06:10 PM.